Read more from Crutchfield writer, Buck P.
By buying this product you'll earn up to 400 Rewards points. Written by Crutchfield's Buck P.
This compact and multi-tasking little workhorse can power a couple of PA speakers with up to 250 watts each — not enough to blast your ears off with loud rock or rap, but plenty enough for spoken word, acoustic music, and even karaoke. Preamp-level monitor and subwoofer outputs let you use your EMX2 with larger powered speakers and subs for those extra-loud shows that may occasionally occur. 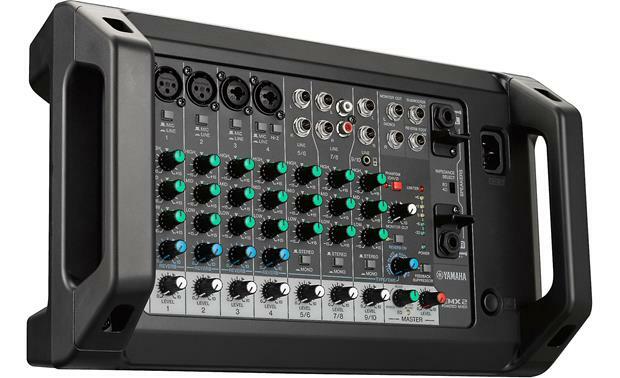 The EMX2 can take up to 4 XLR microphone inputs, 8 line-level 1/4" TRS inputs, 2 RCAs, and even has a 3.5 mm jack that accommodates the headphone signal from any music player. Channel 4 can be switched to Hi-Z mode to accept a high impedance signal, like from a guitar pickup, without needing a direct box or adapter. You can sweeten the sound by adding some reverb, choosing one of the four different reverbs/echoes, then adjusting to your taste. A feedback suppressor automatically helps prevent squealing. A Master EQ™ can add bass for heavy dance music and take it away when you're reinforcing voices only. 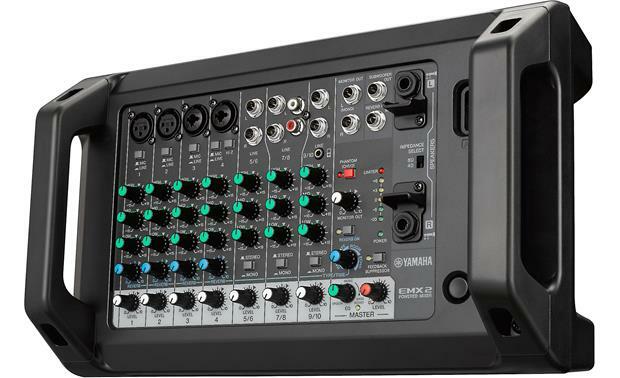 Monitor outputs 2 x 1/4"
Overview: The Yamaha EMX2 is a compact, 10-channel powered mixer that is ideal for small rooms, community centers, or houses of worship. 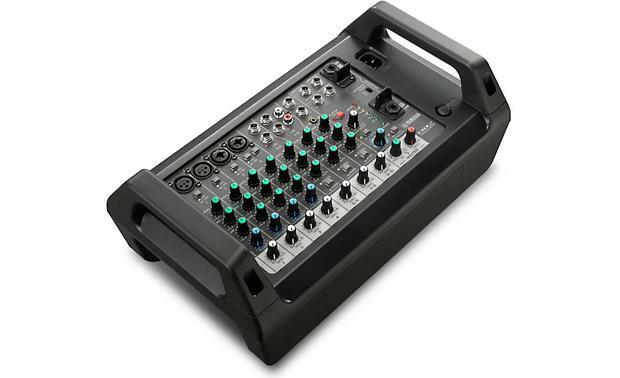 It is lightweight, portable, and easy to set up, making it useful for speaking engagements, parties, DJs, and solo/duo/small band gigs. 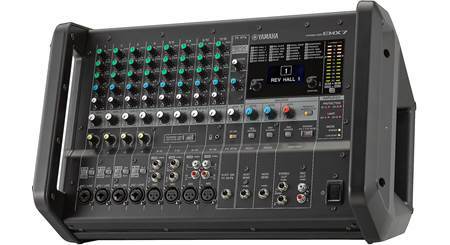 The EMX2 has 4 mic preamps and 3 stereo inputs. 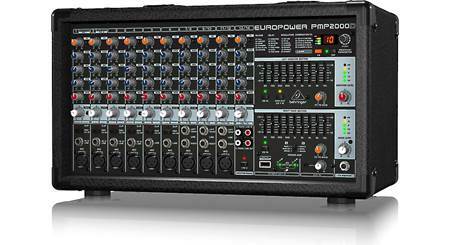 It has 2 powered main outputs and 2 monitor outputs, with a separate output for a subwoofer and footswitch. 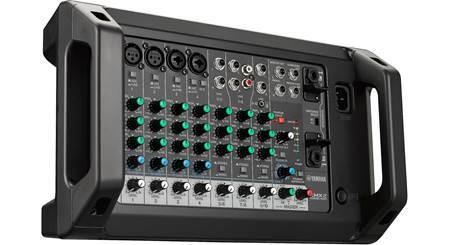 Mic/Line Inputs: The EMX2 is equipped with four Mic/Line inputs (Channels 1-4) for connecting microphones, guitars, electronic musical instruments, or line-level audio devices. Channels 1 and 2 have an XLR jack, while Channels 3 and 4 have combo jacks that support XLR and 1/4" plugs. All four inputs have Mic/Line switches. Phantom power (+30V) can be applied to the XLR connectors on Channels 1 and 2, if needed for condenser mics. Channel 4 also has a Hi-Z switch that lets you plug in an electric guitar or electric bass with a 1/4" plug. Channels 5/6: Channels 5/6 have two 1/4" line input jacks only. Channels 7/8: Channels 7/8 have two 1/4" line input jacks and two RCA input jacks. If both 1/4" and RCA jacks are used at the same time, the 1/4" jack takes priority, muting the audio to the RCA jacks. Channels 9/10: Channels 9/10 have two 1/4" line input jacks and one stereo 3.5mm (1/8") mini-jack. If both connections are used, the stereo 3.5mm mini-jack will take priority. Outputs: The EMX2 features two 1/4" speaker outputs that will output an amplified signal to left and right passive speakers. The speaker outputs are compatible with either 8Ω or 4Ω speakers, and there is an Impedance Select switch to match the impedance of the connected speakers. The speaker outputs each have 3/4" tall metal guards to protect the plugs. The unit also has two 1/4" monitor outputs with a single rotary volume control which does not affect the master level output. The 1/4" subwoofer out lets you connect a powered subwoofer to the system. When the subwoofer jack is in use, a 120Hz low-pass filter is applied to the main speaker outputs. The subwoofer output level is linked to the master level control. A Reverb Foot Switch jack (1/4") lets you connect an unlatched-type footswitch, such as the Yamaha FC5, for toggling on/off the reverb effects. 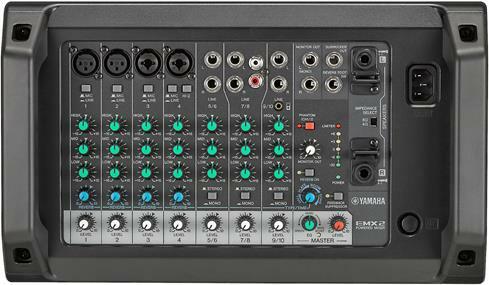 3-Band EQ: The Yamaha EMX2 features a 3-band EQ on each Mic/Line channel and each stereo pair. Each EQ band has a rotary control that lets you boost or cut the frequency by + or - 15dB. The dials have a center detent at 0dB for a flat response in the corresponding band. The EQ bands have the following center frequencies: Low 100 Hz, Mid 2.5 kHz, and High 8 kHz. Master EQ: The mixer has a single knob Master EQ that lets you shape the overall sound to your liking. There are three positions, from Speech (with a limited low end and clear highs) to Music (balanced sound) to Bass Boost (for DJs and other performances that emphasize bass. An LED is provided to indicate when the Bass Boost is active. Feedback Suppressor: The EMX2 is equipped with a Feedback Suppressor that utilizes a unique 7-band notch filter to instantly stops feedback with the push of a single button. 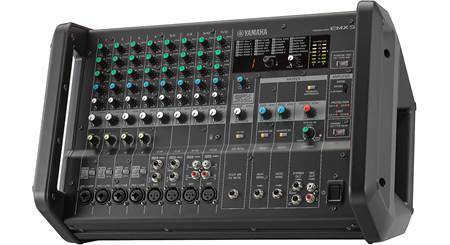 Reverb Control: The powered mixer features high-quality Yamaha reverb effects to add atmosphere to vocal and instrumental performances. Channels 1 through 4 each have a rotary control to apply the amount of reverb you desire. There is a master reverb dial that lets you determine the type of reverb and its length. As you turn the control to the right, the time of the reverb gets longer. The reverb types include Hall, Plate, Room, and Echo. You can turn the reverb effect on and off with the non-locking Reverb switch, or through a connected reverb footswitch. Level Controls: The four mono Mic/Line channels and the three stereo channels have individual rotary level controls. The Master level control determines the volume of the signal output from the Main Speaker and Subwoofer outputs. A 6-segment LED level meter shows the level of the Main speaker output signal (-20, -6, 0, +3, +6, Limiter). When the Limiter LED is constantly lit, the built-in limiter is being engaged, and that the level should be reduced. 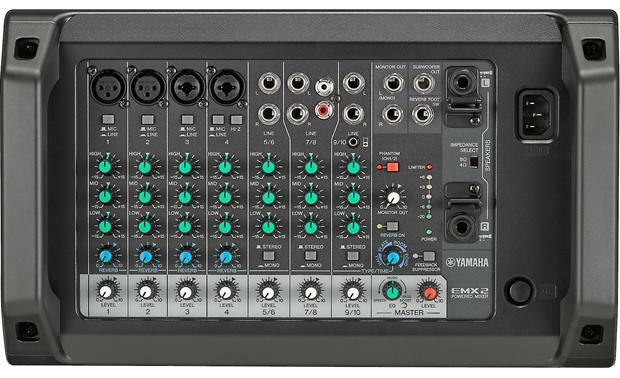 Dimensions: Width: 14.75" Height: 5.8125" Depth: 8.658"
Searches related to the Yamaha EMX2 10-channel powered mixer — 170W RMS x 2. 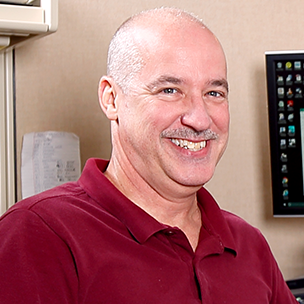 Your staff is incredibly friendly, helpful, & professional - excellent customer service! I've been a Crutchfield customer since 2005. The customer service was great in 2005 and excellent in 2019! Thank you. From sales advice to tech advice it was an amazing experience. Every person was friendly, well informed & very helpful! Crutchfield is my ONLY source for car stereo equipment, and always will be! A huge thank you for the excellent help I received! I felt like we were friends. I'll never hesitate to buy from you! This was my first experience with Crutchfield that will make me a future customer for all my electronic needs. Thanks! I received a hand written thank you note, thanking me for being a customer. You have a customer for life. THANK YOU!